The conceptual ‘Home of the Future’ (HoF) has been a curiosity and fixation for as long as technological design has existed. 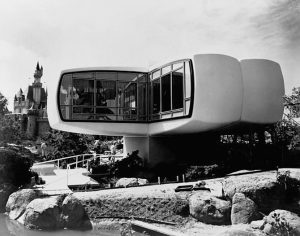 In 1967, a U.S. television special aired the conceptual design for ‘The Home of 2001’, which displayed now-standard technology such as “a console to control the entertainment centers and a monitor for surveillance cameras.” Even earlier, the Monsanto Company installed the ‘House of the Future’ in Disney’s Tomorrowland, complete with microwaves and personal televisions. We have always been interested in how humans might come to live alongside technology, and so it is no surprise that this relationship is often negotiated through the home. When discussing the HoF (or the ‘Smart Home’), Richard Harper points out, “what makes it smart is the interactive technologies that it contains,” meaning that the HoF is always characterized by its fundamental ability to interconnect human inhabitant and technology. The HoF puts human and technology into productive dialogue, becoming the medium through which they communicate, and the place where they engage with each other. This human-tech relationship is at the heart of the HoF, and adapts to both technological and social developments. In this way, the Home of the Future is an old idea that is constantly being reinvented. It represents a foundational curiosity about our relationship with technology, and an ever-evolving (thus, emergent) sense of the possibilities and limits of that relationship. Earlier this year, a team at The Verge set out to create a Home of the Future, and documented the novelties and complications that arose in a 6-part YouTube series. Their finished product, alongside their series, helps us to visualize and understand where the boundaries of our imaginations lie in regards to living alongside, and through, technology in 2018. What characterizes The Verge’s HoF is unique to recent technological and socio-cultural developments. Cloud-computing and an increasing demand for knowledge workers facilitate a breakdown of the previously separate ‘home’ and ‘work’ spheres, increasing the need for external connection within the home. The profusion and pervasion of applications, devices, and platforms puts new emphasis and value onto seamless integration and universal language as an antidote to “living in a fragmented world that requires hopping between apps.” Additionally, widespread literacy in technological customization and interest in designing everyday life has extended beyond personal electronic devices to include the home. The 2018 HoF is therefore cloud-connected, effortlessly integrated, bespoke and adaptive to the user’s unique and dynamic living needs. Three prominent issues arise in the creation of the 2018 HoF: privacy, ownership, and infrastructure. As devices become smarter, they also become more vulnerable, and more valuable. 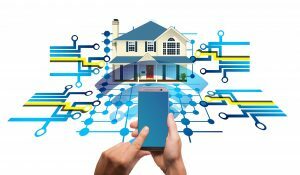 Smart devices, especially those with open networks, can potentially provide “an opening into the network…and to your data.” As Grant Imahara puts it: “products are designed more often with connectivity first and security second,” leaving devices open to “viruses, malware,” hacking, and large-scale cyber-attacks. Imahara also notes that the constant tracking of synchronous devices is essentially, “building out a profile of my behaviors inside my home.” Such precise user behavioral data is extremely valuable to companies like Facebook, whose “revenue ($17.93bn in 2015) directly depends on the user profiling quality.” Economic value becomes attached to all data we create as a byproduct of living in the HoF, and privacy, in turn, becomes a commodity that can be traded for access or convenience, rather than a fundamental right. Boundaries of data collection are nearly non-existent and unknowable in the HoF; in making a cup of tea or picking a movie, you would not be able to discern when, where, by what, for whom, or what kind of data was being collected. Future concerns for privacy may arise from the tactic commonly used by government security agencies of making privacy and security mutually exclusive, whereby private user information (such as phone call metadata) is non-consensually collected for the purposes of national security. However, the data available through the HoF would be considerably more diverse, detailed, and intimate. Each smart device may create new possibilities for convenient and connected living, but they also define the limitations of such living through their software and hardware, which are ultimately not controlled by the end user, but by the corporations that design and produce them. For example, the RTI processor that acts as the ‘brain’ of The Verge’s HoF cannot be programmed by the user, only by a company programmer. Using Lev Manovitch’s idea that software determines what we can do with the technology, we can begin to understand that our control over smart home devices is limited to the authority of the devices’ programmers. Additionally, if we consider that media “shape underlying psychic and social order” by imposing limits and affordances, it is easy to see how we grant corporations, developers, and programmers a unique and powerful authority over the available forms of physical and social living within the HoF. Perhaps the most unique mark of the 2018 HoF is the integration and connection across devices, platforms, and systems; “the ability to string together so many devices to function as one home is the goal.” This goal of a universal digital language relies on a principle of invisibility and seamlessness, “the challenge…is to make all [the systems] disappear.” Such infrastructural invisibility accentuates problems of authority and ownership, as infrastructure often operates as a regulatory fulcrum whereby power over devices and their users is exercised. Imagine not being able to buy a particular cereal from your smart fridge because the brand is “unsupported” by the fridge’s manufacturer. The fridge becomes the material infrastructure through which a corporation’s authority is enacted upon your breakfast choices. 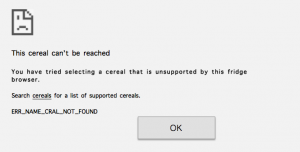 You might not even realize this—you may be offered a list of possible cereals, which does and doesn’t include certain cereals based on corporate sponsorship or partners, and so the restriction is displayed as an affordance, with your attention drawn to the cereal possibilities as opposed to cereal exclusions. With your fridge built seamlessly into a larger purchasing system, you are able to fully ignore the platforms and devices involved, obscuring all processes of production and distribution (and therefore of control, authority, and ownership) to focus solely on consumption. The Home of the Future…Now? The HoF is a remarkable barometer for our present conceptions of the possibilities of living with and through technology. The HoF represents what we believe is possible through media, a physical manifestation of imagined ways of being, of interacting, cooking, cleaning, learning, of welcoming and being welcomed, all “by means of” interactive technologies and media. When Thomas Ricker writes that “The Home of the future is…a place where the home is the computer,” he indicates a larger acceptance that domestic technologies, including the home itself, have become the media through which we live our lives. “These devices are the narrow gate through which…mental and social metabolism passes;” they give definition to what is and isn’t possible, and in this aspect, it is of the utmost importance that we maintain an ability to imagine new possibilities, new relationships with technology, and new modes of living, to remain equal partners in the dialogue.